This collard greens vegetarian recipe is one of the most easy collard green recipes which you can quickly follow and make a delicious and healthy stir fried or sauteed collard greens in few minutes, which takes a total time of 25 minutes. 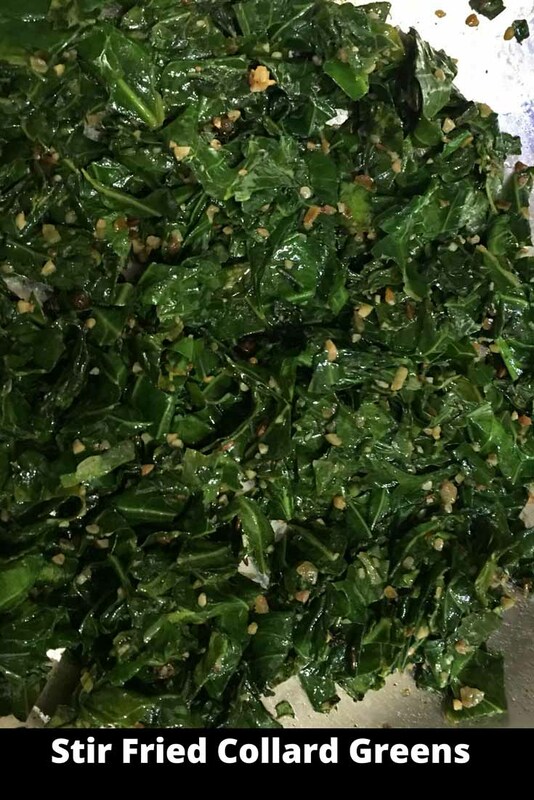 If you wonder how to cook fresh collard greens at home easily and quickly or how long does it take to cook collard greens read this blog post and get the recipe, which will help you to make homemade collard greens in very few minutes. I used a bunch of fresh collard greens to make this stir fried greens which was just enough for two people when cooked. 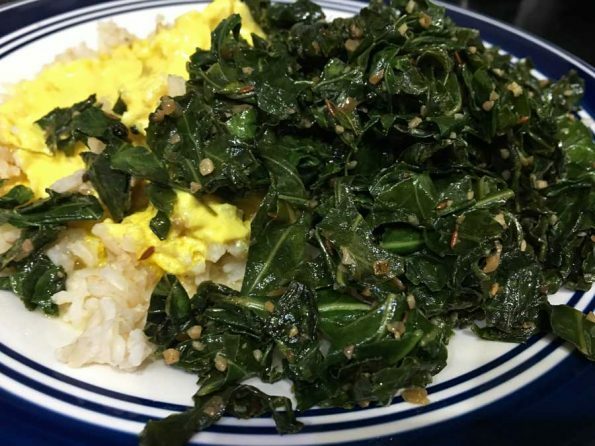 This easy and quick collard greens stir fry gives you a quick, easy, healthy and delicious dish which can be enjoyed as a side dish with rice for lunch or dinner or you can use this in rice bowls as you wish. 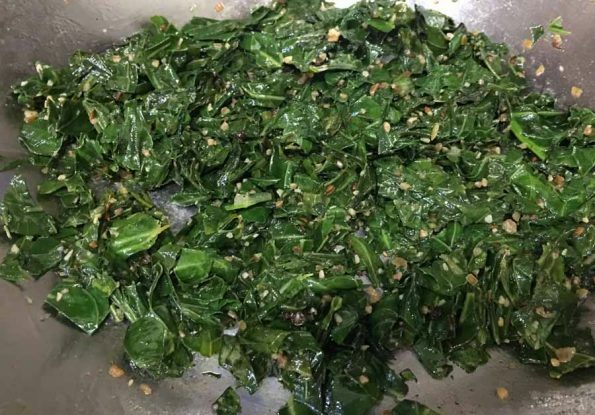 I used few spices like cumin seeds, ground ginger powder, minced onion, minced garlic and black peppercorns which made this collard green stir fry very delicious. If you love easy and healthy green veggie recipes, try this easy delicious oven roasted broccoli florets recipe as well! You may adjust the spices based on your preferences and see how you like it! 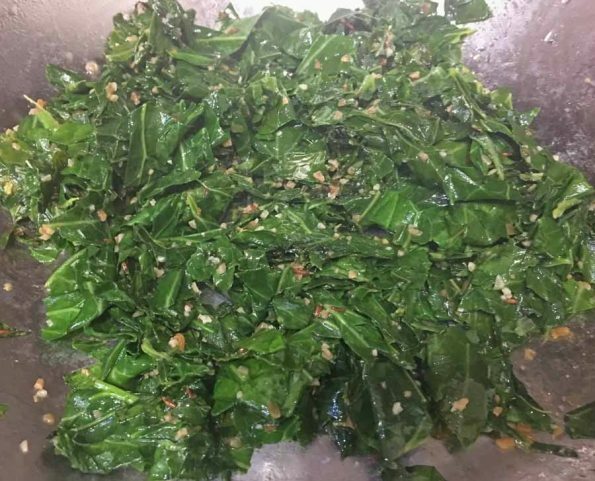 Many of the collard greens recipes call for cooking the greens in water for a much longer time, but I wanted a quick and easy collard greens vegetarian recipe (vegan as well) which I can make in few minutes. I decided to try a stir fry with collard greens and it turned out so delicious. To make this collard greens stir fry, you don’t have to cook the collard greens for a long time, as we make the stir fry in about 10 to 12 minutes! 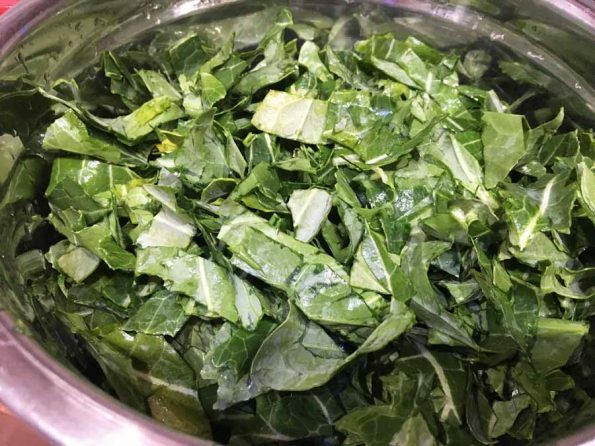 Make sure to wash the collard greens thoroughly before using them for the recipe. Once the greens are washed and cleaned, we will remove the thick stems as we do not use the stems here. Just cut off the long stems and also remove the slightly thick ribs that runs through the center of each leaf. You can stack the leaves together and cut off the ribs that run through the center of the leaves or you can just tear off the leaves from both sides using your hands. Once the stems are removed, you can chop the leaves and start cooking. I used few spices to make the stir fry delicious and I used black peppercorns as well as black pepper powder in this recipe. Instead you may use paprika and crushed red chili flakes. Just make sure not to add too much salt, as the leaves reduce in amount so much as they cook, and so you may not need as much salt as you think. 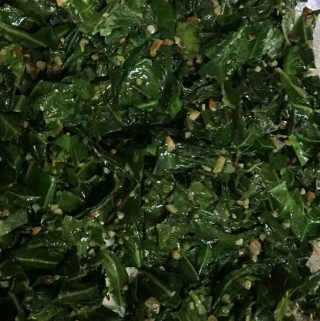 So here is how I made this easy and quick collard greens stir fry following this collard greens vegetarian recipe for stir fried greens. 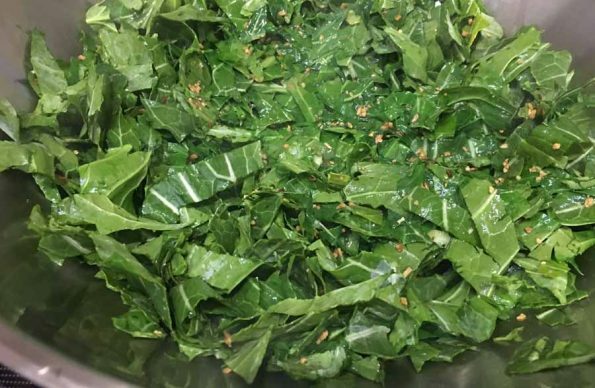 This collard greens vegetarian recipe takes only 25 minutes, which includes the time to prepare the leaves and cook them. So if you wonder how long does it take to cook collard greens (as many recipes call for a very long cook time) or if you are looking for a collard greens recipes that takes less cooking time, try this easy and homemade fresh collard greens recipe, which makes a delicious, crunchy side dish which you can enjoy with rice for lunch or dinner. This easy vegetarian/vegan collard greens stir fry recipe without meat also helps you understand how to cook fresh collard greens easily and quickly. Wash the greens and clean the leaves thoroughly. Cut off the thick stems of the leaves and also the ribs of each leaf that runs through the center of the leaves. Chop the leaves finely or as small pieces, keep this aside. Heat oil in a large pan and add the cumin seeds. When the cumin seeds are lightly fried, add the minced onions, garlic and lightly fry for a few seconds. Add the ground ginger and stir well. Add the chopped collard greens to the pan, and mix everything well. Add the salt, stir the leaves and stir fry for another 2 to 3 minutes. Cover the pan with lid and cook in very low heat for about 8 to 10 minutes. Open the pan in between to give a quick stir and to make sure the greens are not sticking to the bottom of the pan. You may add a little more oil or sprinkle little water if necessary(I didn't add any extra oil or water and it cooked perfectly fine). After 8 to 10 minutes of cooking, open the pan, stir the contents and add the black peppercorns and black pepper powder. Stir fry the contents for another 2 minutes and serve the stir fried and spiced collard greens hot with rice for lunch or dinner! Below you can see stir fried collard greens served with rice and Indian style yogurt curry! 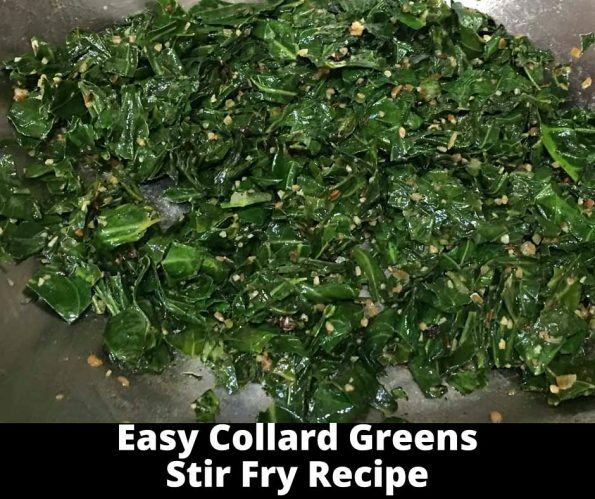 Hope you found this post on easy quick collard greens stir fry or collard greens vegetarian recipe helpful in making easy, quick, yummy and healthy collard greens stir fry for lunch or dinner!